This ministry serves the members of our Community who are not able to attend Mass on a regular basis because of long term disability or a short recuperation time. 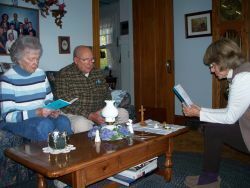 Trained, volunteers visit to bring news, fellowship, and most importantly, Holy Communion to the homebound. Ministers receive training and support in this ministry as members of the Body of Christ, bringing the Body of Christ to our homebound. If you or a family member would like to have a visiting minister, call (585) 544-8880. Do you have some time to share with a person who is homebound? If you are a person of Faith, have a caring, loving nature and are a good listener, this can be a place for you. A 2-part training session for new visiting ministers will be held in the future.